This smokey little number is perfect for BBQ season + would make a great side dish at a summer event. It's also a main attraction by its own right though, and, given our typically muddled summer season, is also ideal on its own on a cloudy day. Which is exactly what tonight is all about. I've shared vegan chilli recipes before; the main difference here is the oaky, barbeque flavour from the chipotle paste. One serving of this dish provides 17g protein, so perfect if you're looking for plant based protein sources. Tonight, I had mine with jalapenos and crumbled feta (not vegan I know), and I've also got it for lunch tomorrow with some chicken I barbequed (again, not vegan..). It would work well with a fresh spinach salad or quinoa, or a thick slice of bread to mop up all the sauce. 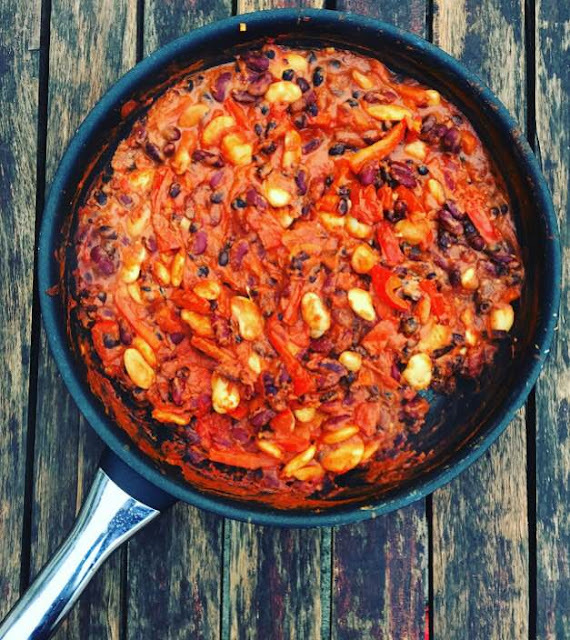 If you want any more vegan chilli recipes, I highly recommend Deliciously Ella's cannellini bean stew or her black and kidney bean chilli.